The Best Fishes project is frequently asked ‘can I eat farmed salmon?’ and ‘which salmon can I eat?’ The answer, however, is also a question as it depends on what it important to the consumer. If they are mostly concerned with the health benefits of eating fish, then the answer seems to be yes. A recent review of research by a Norwegian institute to assess how ‘healthy’ salmon is found that farmed salmon has improved in terms of decreased contaminants, and is now a ‘healthier’ option in those terms than wild salmon. The level of antibiotic use was recorded as the lowest since the 1970s. In fact the use of antibiotics in Scotland is very low, with many farms claiming no use for at least 5 years. The review also found residues of substances used for medical treatments to be within safe levels. The decrease in contaminants is largely due to the substitution of wild fish in salmon feed with plant based alternatives. This also leads to a lower omega-3 level in farmed salmon, however they do have some ability to convert it from plants. Farmed salmon is still seen as a good source of omega-3, and in particular of protein, for which there is no difference with wild salmon. If the consumer is more concerned with the environmental impact of the farmed salmon, the answer is less straightforward. The latest Seafood Watch guide produced by the Monteray Bay Aquarium has rated Scottish salmon from Orkney as a ‘Good Alternative’, largely resulting from naturally low sea lice levels. The criteria assessed were data availability, effluent, habitat, chemicals, feed, escapes, disease, source, wildlife mortalities and escapes of other species. The ‘Good Alternative’ rating means ‘buy, but be aware there are concerns with how they’re caught and farmed’. The Marine Conservation Society (MCS) UK’s Good Fish Guide rates Atlantic salmon produced in open net pens in Europe and certified organic as a ‘Fish to Eat’ under its sustainability range. 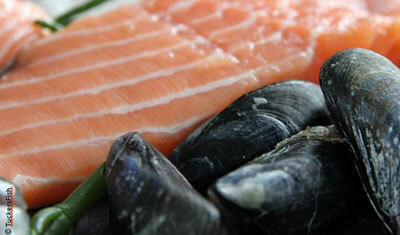 Other farmed Atlantic salmon including GlobalGAP and GAA BAP are rated as ‘don’t eat too often’ by the Good Fish Guide. So it seems that organic salmon from Orkney should be acceptable in terms of environmental sustainability. As this is not going to come close to supplying the market for Scottish salmon, the savvy consumer will have to use the Best Fishes certification and retailer guides to assess what their own ‘suitable alternative’ is. Mussels anyone?